First of all, let me start with a question; why do we have so much excess of clothes in our closets? It doesn’t help that these stores always have these absurd sales of “buy 2, get 2 free” or “bogo”, etc. They just compel us to buy in excess and things we don’t really need. I end up feeling guilty the second I leave the store thinking, ‘why did I buy so much?’ Plus, I’m spoiling my kids and I have nowhere to put all these clothes! Now I need to bother my husband that I need a bigger closet made for both me and the kids! On the other hand, however, if you don’t shop the sales, you feel like you are missing out on something! It’s a lose-lose situation! I hosted a holiday bazar at my house a few months ago. There, I met a lady, who absolutely inspired me! When asked what she does, she told me she “Organizes” for a living. What?! What does that mean, you organize! You actually get paid to organize? Okay, I need to be open-minded and logical over here. People do actually get paid to help organize other people’s lives, whether it be work-related, house-related, relationship-related or whatever. Hey, come to think of it, that’s awesome! So…..if she does this for a living, then she herself, must be extremely organized as well, right. Yes, she is organized now but she certainly didn’t start off that way. It came from a place of necessity after living in excess for years. Well, you don’t even want to know the reaction I got from this very simple, sweet, organized and perhaps ‘minimalist lifestyle’ lady. Her facial expression was one of absolute shock and it made me fee like I am the worst mom who has ever walked the face of this earth! Oh, dear! Where did I do wrong? Being a teenager today can be challenging, especially with all the influences around us. Teens never have enough to wear! You know why? Because it’s just fun to shop and buy! Once it gets home, they wear it once or twice, then forget about it! Well, for all you ladies out there, maybe some men as well these days, with closets that are “filled to the gill”, let me tell you what her response was! Basically, my daughter’s one long, run-on, sentence described what this lady has in her ENTIRE closet! Essentially, she has four skirts, four dresses, six shirts, three sweaters, two necklaces, three sets of earrings and six pairs of shoes. (Sounds like my husband, come to think of it!) That’s it! 1. Minimize what you have, not only in your closet, but around your home as well. 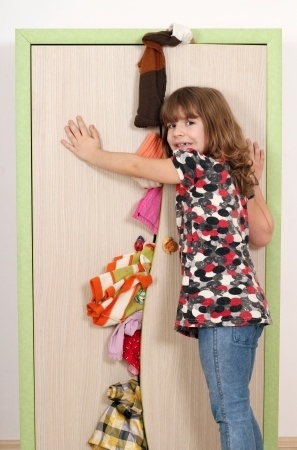 Please see our Playdate article How to Get Organized – Ten Step Program. 3. Buy what you Need, NOT what you can use! We all get sucked into these sales! Only go to the mall with a purpose! Only go shopping with a focus of exactly what you are there for. Funny I should come across this lady, because she reminded me of my days, as a teenager, when we didn’t have much and my mom would buy me just two skirts and 4 tops. I had one pair of fancy shoes, a cross-trainer tennis shoe and a casual shoe. She taught me how to mix and match. I was happy and never felt like I was missing much. Each time, my friends thought I was wearing something new. What ever happened to the olden days…to simplicity?